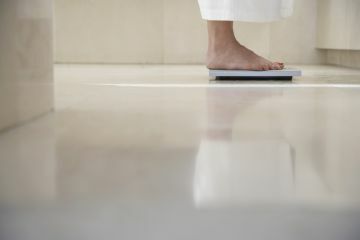 According to a new study, being underweight before and during pregnancy can have serious risks, just like being overweight does. We hear a lot about how important it is not to be overweight when trying to conceive and to only gain a healthy amount during pregnancy, but less attention is given to the problems associated with being underweight. A new study, however, find that two of the three major risk factors for preterm birth—which can cause a baby to have serious disabilities or even die—are related to mom not weighing enough. The study at Cincinnati Children’s Hospital Medical Center looked at nearly 400,000 Ohio birth records from 2006 to 2011 and identified these three major risk factors for preterm birth, or birth before 37 weeks of gestation. "The highest risks for premature birth were in women who were underweight, had poor weight gain during pregnancy, or short periods of time between pregnancies," said Emily DeFranco, D.O., a physician-researcher at the Center for Prevention of Preterm Birth at Cincinnati Children's and an associate professor of maternal-fetal medicine at the University of Cincinnati. The researchers exclusively studied live, non-multiple births—and 90 percent of the women studied had risk factors for preterm birth. Fewer than half of the women sampled were within the healthy weight range when they got pregnant, and just 32 percent gained the recommended amount of weight during pregnancy. It’s worth noting that excessive weight gain in obese women also increased the risk of preterm birth. Preterm birth is a real fear for pregnant women: The March of Dimes reports that preterm birth rates are a significant 12 percent in the United States, above the global average of 11.1 percent. The risk factors for preterm birth identified in this study, however, are controllable and can be avoided. "Attention should be paid to educational interventions on the importance of birth spacing, achieving an optimal pre-pregnancy weight, and ensuring adequate nutrition and weight gain during pregnancy," Dr. DeFranco said. "Improvements in these modifiable risk factors could have significant influence on premature birth and infant mortality worldwide." Our advice? Do everything you can to make sure you’re as healthy as possible before you get pregnant—and think about having a conversation with a doctor or nutrition expert if you’re clinically underweight. Once you become pregnant, make sure you’re gaining weight at a healthy and steady rate. Keeping your weight within the normal range—and spacing your pregnancies out appropriately—might just help you avoid giving birth before you’re at term.